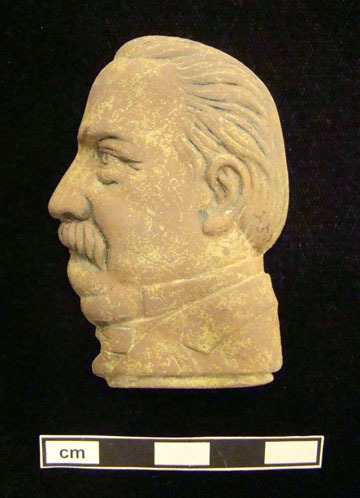 This small, decorative object depicting the profile of President Grover Cleveland is the partial remains of a match safe recovered from the Jackson Homestead site, an African-American site in Montgomery County, MD. The complete object, measuring 6.5 cm by 4.5 cm, would have had a matching profile on the opposite side and a hinged lid at the neck. Match safes were small, portable metal cases used to keep matches dry and, since early matches could be unreliable, a match safe also prevented accidental ignition. They came into use in the 1830s and were particularly popular between 1890 and 1920. Match safes of political figures were common as campaign items.